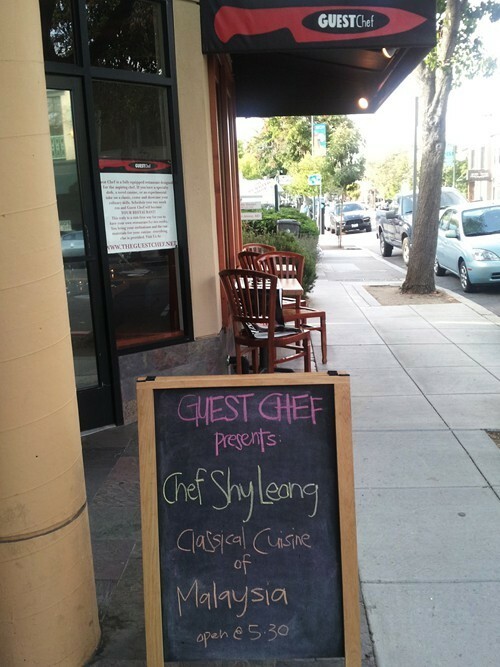 Yihshyong “Shy” Leong, the latest contender to “pop up” at Oakland’s Guest Chef (5337 College Ave.), has done pretty well for himself since his two-week stint at the the restaurant began. He’s drawn rave reviews on Chowhound. Apparently, he’s turned enough tables to warrant a weeklong extension to his stay — he’ll be manning the stoves through the end of this weekend. What’s more, Leong is shining a light on a cuisine that’s little known to many Bay Area residents: the food of his native Malaysia. By now I’m sure you’ve heard of Guest Chef, the innovative Rockridge dining establishment with no permanent chef. Instead, anyone with decent-enough cooking chops (caterers, food truck operators, aspiring restaurateurs, maybe even your mom) can apply for a two-week session in the kitchen — two weeks where you get to try your hand at running your own restaurant, basically. Owner Scott Cameron takes a cut of the chef’s gross receipts in exchange for providing the kitchen, the basic cooking equipment, a cashier/dishwasher/busser/server, and some social media driven PR. The chef creates the menu, buys the groceries, and cooks the food. Despite a single lukewarm dining experience I had during Guest Chef’s early months, I try to keep tabs on its revolving-door lineup of chefs and chef wannabes. It’s the business model’s weakness and also its great strength: The food of the current chef just might not appeal to you ... but wait two weeks and there will always be something new to try. I haven’t had Malaysian food since I moved out to the Bay Area, so when I saw Leong’s menu, I thought it would be as good a time as any to give Guest Chef another shot. There are about nine different dishes Leong’s menu, and he’s set it up so that you can order a la carte (at $10 a dish) or opt for a tasting menu with your choice of four dishes (for $34). The portions are big enough that you’d have to be a pretty hearty eater to eat four dishes on your own — two of us still had leftovers after supplementing the prix-fixe with two additional dishes. Leong told me, in an email, that the defining characteristic of Malaysian cuisine is that it is “powerful in execution yet gentle in delivery,” with high-contrast flavor profiles. His cooking uses lots of lemongrass and galangal and complex spicing (though it’s relatively mild, in terms of heat). Many of the dishes are Leong’s versions of very traditional dishes. There was beef rendang, a slow-cooked brisket that had an intensity of flavor that was almost akin to Asian beef jerky and was served with turmeric-infused sticky rice. There was satay daging ayam, messy-to-eat grilled chicken skewers that were coated in a spicy cashew sauce. I didn’t like everything — I found a couple of items too salty and one-note — but the best of Leong’s dishes were sublime: sophisticated, full of nuance, and obviously super-labor-intensive. I loved the delicate lemongrass flavor of his sup ikan, a shellfish-and-heirloom-tomato broth that had been poured, boiling-hot, over crispy fried king grouper cheeks. And Leong’s thousand-layer cake, a traditional Dutch-Indo-Chinese delicacy, was truly stunning: buttery and rich without being too sweet, and somehow both light and dense at the same time. Leong explained that each layer of the cake is broiled one after the other — not literally a thousand layers, but maybe a dozen that I could count. 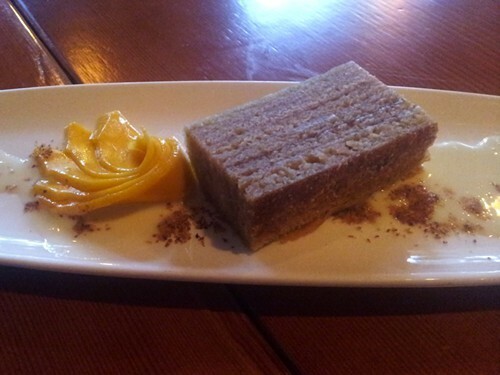 Thousand-layer cake, served with coconut condensed milk and slices of fresh mango. Unlike some of the other cooks who have been featured at Guest Chef, Leong is no fresh-faced newbie in this chef game. He was the executive chef at the Trader Vic’s flagship restaurant in Emeryville for eight years, he has done lots of private cheffing, and he’s now a popular cooking instructor at Berkeley's Kitchen on Fire. As noted, Leong’s food will be available at Guest Chef through Sunday evening, so there’s still time for you to check it out. Or, if you want a more hands-on experience with Malaysian cuisine, you can sign up for one of Leong’s classes. He’s got one that focuses on vegetarian Malaysian dishes coming up on Tuesday, September 4. Interestingly enough, when I asked Leong whether his stint at Guest Chef was a practice run for opening up his own Malaysian restaurant in the Bay Area, he said he didn’t have any such plans in the works. If anything, he said, he’s hopeful that some of his students will someday take on that challenge.